Jacob Mamathodath was born on 22nd February 1947 at Kodamthuruth, Palakkad as the eldest son of Kurian and Kathreena. He has one brother and five sisters. Jacob had his primary education in the L.P. School Kodamthuruth and High School studies in the E.C. E.K. Union High School, Kuthiathode. After S.S.L.C. he Joined the Sacred Heart Minor Seminary, Ernakulam. Two years later he was sent to the Papal Seminary, Pune, where he took Licentiate in Philosophy and Master’s Degree in Theology. He was ordained priest on 4th November 1972. In 1979 Fr. Jacob was sent to Rome for higher studies. He Took Doctorate in Theology from the Gregorian University, Rome. After ordination, Fr. Jacob was first appointed Assistant Vicar of St. Mary’s Cathedral Basilica, Ernakulam and then Private Secretary to the late Mar Joseph Cardinal Precattil. 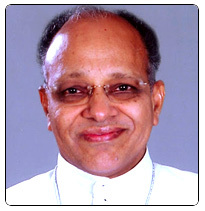 After his return from Rome in 1984, he served the Archdiocese of Ernakulam in various capacities, as Archdiocesan Secretary, Secretary to Mar Antony Cardinal Padiyara, Promoter of Justice and Defender of Bond at the Archdiocesan Tribunal, Chancellor, Parish Priest at Elamakara and Chempu, Eparchial Consulter, Executive Secretary of Save a Family Plan (India) and the Editor of “Ernakulam Missam”. In 1990 he was appointed Professor at St. Joseph’s Pontifical Seminary, Aluva. On 6th September 1992 he was nominated titular bishop of Abydus and bishop Auxiliary of the Archdiocese of Ernakulam. He was ordained Bishop on 28th November 1992 and appointed Vicar General of the Archdiocese of Ernakulam. His Holiness Pope John Paul II appointed him Bishop of Palghat on 11th November 1996. He took Canonical possession of the Eparchy on February1, 1997. His Holiness Pope Francis appointed him Apostolic Administrator of Ernakulam-Angamaly on 23rd June 2018.